Spend a lazy day at Red Lodge’s Wild Bill Lake, smiling as you cast your line, watching as Girl and Boy Scouts from nearby summer camps get soaked learning to tip and upright canoes. Wild Bill Lake is open to licensed anglers year-round. Wild Bill Lake is regularly stocked with rainbow trout. Wild Bill Lake is still a quaint, little story-book lake, handicapped-accessible, and remains popular fishing destination for families with younger kids. It takes less than ½ an hour to walk the mile around Wild Bill Lake in Custer’s National Forest. Easily accessible from Red Lodge, Montana, it takes less than ½ an hour to walk the mile around Wild Bill Lake in Custer’s National Forest, yet this small, tranquil alpine lake can yield some big whoppers – and feisty trout – for patient anglers. Bill Kurtzer hand-built a dam and water diversion system in 1902 that formed a glacial depression into the lake Wild Bill is today. Kutzer’s original construction, intended as a commercial fishing and recreation enterprise, included a heated swimming pool and concrete dance platform near a rock fireplace, as well as boat rentals to fishermen angling for stocked whitefish. Wild Bill Lake is still a quaint, little story-book lake, handicapped-accessible, and remains popular fishing destination for families with younger kids and is best fished from either of the two docks, the shore, or via one-to-two person, non-motorized fishing vessels. In accordance with the Eastern Montana District Montana Fishing Regulations, Wild Bill Lake is open to licensed anglers year-round. Large flyhatches in late Spring and early Summer indicate it’s a great time to get out and fish Wild Bill Lake. Consider hiring an expert guide listed here to coach you toward perfect casting. 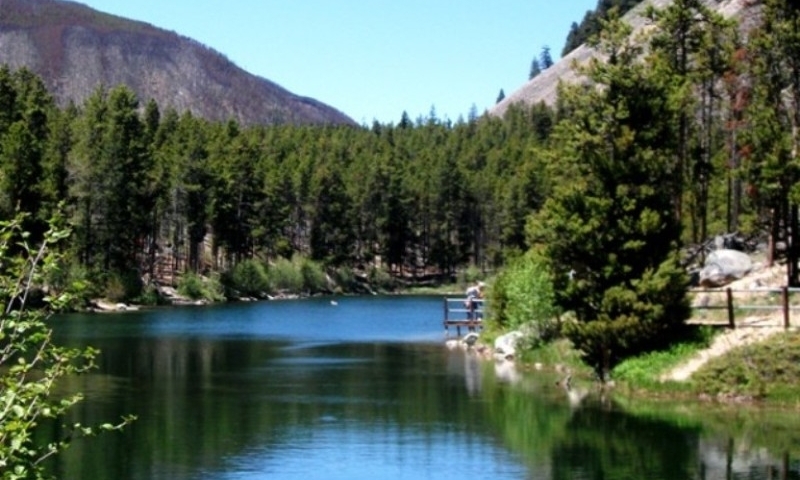 Wild Bill Lake is frequently stocked with rainbow trout by Montana Fish Wildlife & Parks. Follow Ski Run Road (West of Red Lodge) for about 3 miles, turn on West Fork Rock Creek Road, and continue walking onto the West Fork Canyon footpath leading ¼ mile to Wild Bill Lake.